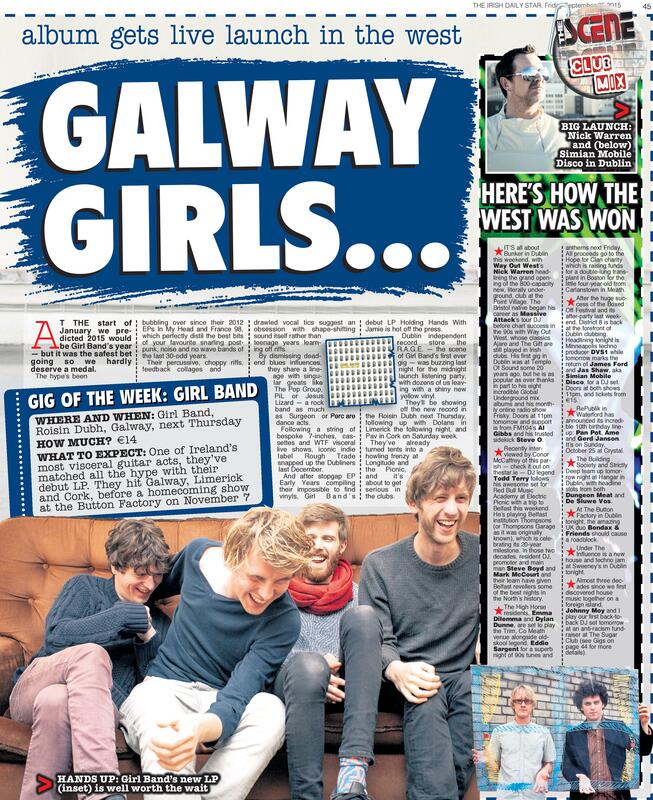 AT the start of January in The Star I predicted 2015 would be Girl Band’s year — but it was the safest bet going so we hardly deserve a medal. It was a bit embarrassing making the ‘bet’, but here we are. The hype’s been bubbling over since their 2012 EPs In My Head and France 98, which perfectly distil the best bits of your favourite snarling postpunk, noise and no wave bands of the last 30-odd years. Their percussive, choppy riffs, feedback collages and drawled vocal tics suggest an obsession with shape-shifting sound itself rather than teenage years learning off riffs. By dismissing deadend blues influences, they share a lineage with singular greats like The Pop Group, PiL or Jesus Lizard — a rock band as much as Surgeon or Perc are dance acts. Following a string of bespoke 7-inches, cassettes and WTF visceral live shows, iconic indie label Rough Trade snapped up the Dubliners last December. And after stopgap EP Early Years compiling their impossible to find vinyls, Girl Band’s debut LP Holding Hands With Jamie is hot off the press. Dublin independent record store the R.A.G.E. — the scene of Girl Band’s first ever gig — was buzzing last night for the midnight launch listening party, with dozens of us leaving with a shiny new yellow vinyl. They’ll be showing off the new record in the Roisin Dubh next Thursday, following up with Dolans in Limerick the following night, and Pav in Cork on Saturday week. They’ve already turned tents into a howling frenzy at Longitude and the Picnic, and it’s about to get serious in the clubs.